UK, 1967, 105 Minutes, Colour. Dirk Bogarde, Stanley Baker, Jacqueline Sussard, Michael York, Vivien Merchant, Delphine Seyrig. Accident was made by director Joseph Losey after beginning a successful career during the blacklist period. Making films in the 50s under a pseudonym, her emerged in England in the early 60s with Eve and These are the Damned. With The Servant, made in collaboration with Harold Pinter, he emerged as a leading director of the 60s. He went on to make such films as King and Country and Accident. 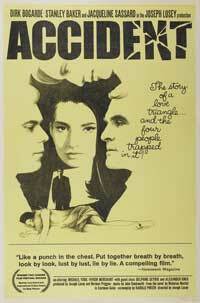 The screenplay of Accident is also by Harold Pinter. Dirk Bogarde appeared in several of Losey's films during this period. Michael York performs in an early role. Vivien Merchant for many years the wife of Harold Pinter, appears in a striking role and the French actress Delphine Seyrig also appears. Photographed beautifully in colour with oxford settings, the film is a very interesting drama of the 60s about identity and meaning. It benefits by Pinter's dialogue and by Losey's precise direction. 1. The significance of the title? Its application to the real accident? Did it have a wider meaning? 2. Comment on the dramatic structure of the film: beginning and ending with the accident (the same sounds and the same timing) and on the nature of the flashbacks. Comment on the use of colour ? would the film have been different in black and white? How did the structure and colour combine with acting etc. emphasise themes? 4. How was the world of Oxford even more concentrated in Stephen's world? what kind of world was Stephen's world? As an image of Oxford, as embodying Oxford? 5. How sympathetic a person was Stephen? our initial seeing of him in the context of the accident? What needs did he have? His capacity for relationships - with his wife, with Charlie, his patronising of William, his fascination with Anna, his casual remembering of relationship with Francisca? How dedicated was he to his work? What did it mean to him? His influence on younger people? His academic background and his philosophising? The contrast between himself and Charlie? In style, in personality, morality, and in the world e.g. of television? The picture of Stephen in small details e.g. the picnic, the Sunday and the way that it went, at home with his children etc.? How was Stephen an "Everyman"? An ageing "Everyman"? 6. How central was William to the film? The fact that he died in the accident? (The horror of standing on his face?) His promise, his youth, his enthusiasm, his searchings for love and truth? Why did he respond so well to Stephen? His dependence on Stephen and admiration for him? His fascination with Anna ? naivety as regards Anna? The style of life that he led, his sports' achievement, mixing with the young, his drunkenness? Would William have turned into Stephen had he lived? 7. How important was Anna for the film? As a person in her own right with a personality? As a woman who was a sign of contradiction for the men? Her character - as foreign, as a student, as enigmatic, as self-satisfied? The impact that she made at the time of the accident? Her being rescued by Stephen? why did she love William and lead him on? Why was she going to Harry him? Her affair with Charlie and its visual presentation in the film? How callous was she? The importance of the discussions with Rosalind? The final night that Stephen had with Anna? The meaning of this? As a symbol of Stephen's needs? of his inability to relate consciously and her being conscious? The secret that he would have for the rest of his life? His privacy? 8. How commonplace a character was Charlie? As typically Oxford? As self-satisfied? His role in the university, academic, sport? His relationship with his wife and her bitterness? (Stephen's concern in consulting her?) The way that this was filmed ? Stephen in conversation with Rosalind? Charlie and his blindness and his inability to be disillusioned? 9. The contribution of Rosalind to the film - as a loving wife and mother, so ordinary, as foil for Stephen? AS wise in her relationships with Charlie, Anna, William? The balance that she offered in the film? 10. What was the significance of Stephen's leaving the Oxford world and going to London ? a reflection that there was another world, the contrast of the TV world with the Oxford world? The impact that this had on Stephen? 11. Why did Stephen visit Francesca? Its importance at this stage of his life? Reliving the past? What kind of person was Francesca? Why did she respond to Stephen? Going out with him, spending the night with him? The meaning of this? Would they ever meet again? 12. The character of the Provost - as an authority in Oxford, relating to Stephen and Charlie, as Francesca's father? The sequences where he appeared and the Oxford overtones ? in the common room, at the cricket match? 13. How important were various incidents in the film (accidents) for giving dramatic significance ? the Sunday, the picnic, the games etc.? 14. What did the film have to say about man and his need for relationships, on the quality of love. on the nature of privacy, of the relationship between man and woman? Was this a deep film? Or was it a surface film with deep implications? why?